Hibernian moved up to second in the Scottish Championship after beating Alloa Athletic, who slipped to the bottom of the table. 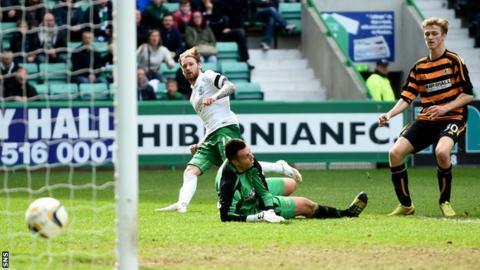 Martin Boyle stylishly gave Hibs the lead and Liam Craig doubled their advantage. Jason Cummings added a third before Iain Flannigan struck for the Wasps. But Dominique Malonga's tap-in ensured victory for the hosts, who capitalised on Rangers' draw with Falkirk to move up the table. Hibs now lead Rangers by a point ahead of next week's final round of league fixtures. Alan Stubbs' side visit Falkirk when Rangers will be up against title winners Hearts at Tynecastle. Danny Lennon's Alloa can still escape automatic relegation and indeed the relegation play-off spot if they beat Cowdenbeath next week and Livingston drop points to Queen of the South. Hibs dominated from the first whistle against the Wasps, Jordon Forster having a header cleared off the line. And the opener came when Boyle collected a pass from Scott Allan, raced into the box and finished low across goalkeeper John Gibson. Craig then netted with a cross that found its way into the net. The second goalscorer hit a post with a swerving shot from distance before Malonga raced away and picked out Cummings for Hibs' third. Flannigan rifled in Alloa's response from the edge of the box but Forster headed back across goal for Malonga to complete the scoring. Match ends, Hibernian 4, Alloa Athletic 1. Second Half ends, Hibernian 4, Alloa Athletic 1. Substitution, Hibernian. Scott Martin replaces Scott Robertson. Substitution, Alloa Athletic. Michael Chopra replaces Ryan McCord. Attempt blocked. Dominique Malonga (Hibernian) right footed shot from the left side of the box is blocked. Attempt blocked. Martin Boyle (Hibernian) right footed shot from the centre of the box is blocked. Substitution, Alloa Athletic. Isaac Layne replaces Liam Buchanan. Attempt missed. Kevin Cawley (Alloa Athletic) header from the centre of the box is close, but misses to the left. Goal! Hibernian 4, Alloa Athletic 1. Dominique Malonga (Hibernian) right footed shot from very close range to the bottom left corner. Assisted by Liam Fontaine. Corner, Hibernian. Conceded by John Gibson. Attempt saved. Martin Boyle (Hibernian) left footed shot from the left side of the box is saved in the top left corner. Foul by Greg Rutherford (Alloa Athletic). Attempt missed. Samuel Stanton (Hibernian) right footed shot from a difficult angle and long range on the left is close, but misses to the right. Goal! Hibernian 3, Alloa Athletic 1. Iain Flannigan (Alloa Athletic) right footed shot from the centre of the box to the high centre of the goal. Assisted by Mark Docherty with a cross. Goal! Hibernian 3, Alloa Athletic 0. Jason Cummings (Hibernian) left footed shot from very close range to the centre of the goal. Assisted by Dominique Malonga. Attempt saved. Jason Cummings (Hibernian) right footed shot from the left side of the box is saved in the bottom left corner. Liam Craig (Hibernian) hits the right post with a right footed shot from outside the box. Greg Rutherford (Alloa Athletic) wins a free kick in the defensive half. Second Half begins Hibernian 2, Alloa Athletic 0. First Half ends, Hibernian 2, Alloa Athletic 0. Goal! Hibernian 2, Alloa Athletic 0. Liam Craig (Hibernian) right footed shot from a difficult angle and long range on the left to the top left corner. Assisted by Scott Allan. Scott Allan (Hibernian) wins a free kick on the right wing. Substitution, Alloa Athletic. Greg Rutherford replaces David Ferguson. Attempt saved. Jason Cummings (Hibernian) right footed shot from a difficult angle on the right is saved in the top centre of the goal. Attempt missed. Liam Fontaine (Hibernian) left footed shot from outside the box is close, but misses to the right. Goal! Hibernian 1, Alloa Athletic 0. Martin Boyle (Hibernian) right footed shot from the right side of the box to the bottom left corner. Assisted by Scott Allan. Scott Robertson (Hibernian) wins a free kick on the left wing. Attempt missed. Dominique Malonga (Hibernian) header from the centre of the box is too high.